It's time to ~stomp out~ boring winter outfits. 1. Lace-up over-the-knee boots for getting a ~leg up~ on upgrading your usual outfits with one of this season's biggest trends. Get them from Amazon for $14.99+ (available in sizes 5.5-11 and in 11 colors). 2. Lucky Brand leather ankle booties, because these'll make sure repetitive and boring winter outfits are hissstory. Yes, even your everyday all-black looks. Get them from Amazon for $44.99+ (available in sizes 5-12 and seven styles). 3. 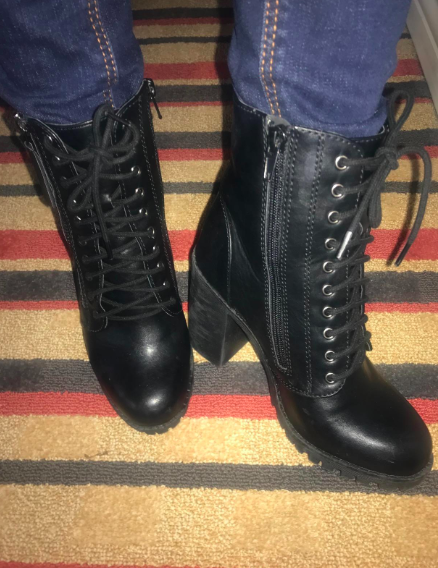 Lace-up faux leather combat boots with adjustable ankle buckles that'll tell you to get a ~grip~ when you test out the salted roads. Get them from Free People for $168 (available in sizes 5-10 and five colors). 4. Embellished, chunky-heel ankle boots so you can easily elevate your style while staying safely low to the ground. Get them from Amazon for $24.99+ (available in sizes 5-11 and seven styles). 5. Faux suede slouchy knee-high boots with stacked heels for a way to slay every day, no matter how low that thermometer drops. Get them from Tobi for $39 (originally $98; available in sizes 5.5-10 and two colors). 6. Low wedge lace-up booties, because these'll never let you down — onto the ground, that is. The days of slippery sidewalks ruining our outfits are OVER. 7. Plaid heeled ankle boots that'll stomp out mid-winter fashion ruts. Think of these as a ray of sunshine to break up nonstop gray weather. Get them from DSW for $49.98+ (available in sizes 6-11 and six styles). 8. Ombré Chelsea rain boots so stormy mornings never damper your ability to look presentable rain or shine. Your outfits won't be interrupted by clunky galoshes any longer! 9. Velvet thigh-high heeled boots for transforming your usual LBD into an absolute head-turner — even snowmen's heads, if they had necks. Get them from Amazon for $29.07+ (available in sizes 5-11 and three colors). 10. Suede studded ankle boots, because these'll make you at least *look* tough when you realize you can see your breath outside. You can make it to the office, I PROMISE. Get them from Asos for $41 (originally $103; available in sizes 4-11). 11. Nylon drawstring snow boots that'll turn shoveling your sidewalk into an impromptu photoshoot. You've definitely earned a humblebrag post. They're lined with faux fur for ~extra warmth~! Get them from Amazon for $37.90 (available in sizes 5.5-10.5 and four styles). 12. 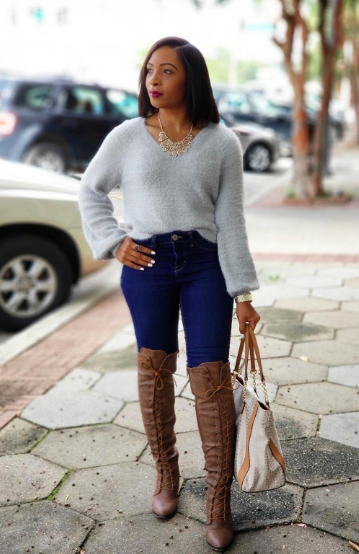 Wide-width cowboy boots so you don't feel like you're facing the Wild West when it comes to finding shoes that are comfortable AND fashionable. They're both wide-width and wide-calf! Get them from Torrid for $74.90 (available in sizes 7-13). 13. 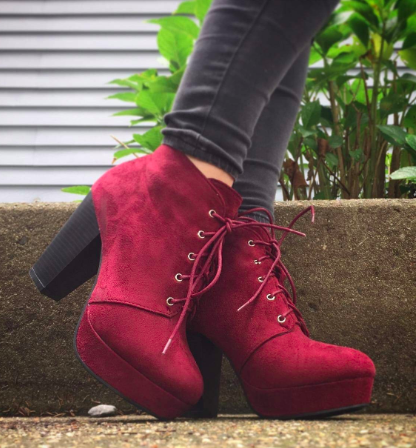 Velvet combat boots for making a smooth transition when spring finally comes along. Tl;dr: you can really wear these all year. Get them from Amazon for $36.99 (available in sizes 6-10 and four colors). 14. Metallic curved Chelsea boots, because these are about to become your go-to when going out for the night. Your piggies don't deserve to freeze in heels. Get them from Missguided for $45 (available in sizes 5-10). 15. Block-heeled over-the-knee boots with drawstring ties that'll make every single outfit you wear this season look effortlessly cool (even the sweater grandma knit for you). 16. Checked square toe calf boots so you can start a *pattern* of feeling extra elevated, thanks to these trendy block heels. Get them from Charles and Keith for $79 (available in sizes 35-41 and three colors). 17. Faux shearling snow boots for kicking up a storm of Insta likes the minute you post yourself in these. It'll almost make up for never having snow days anymore. Get them from Amazon for $32.99+ (available in sizes 5-11 and eight styles). 18. 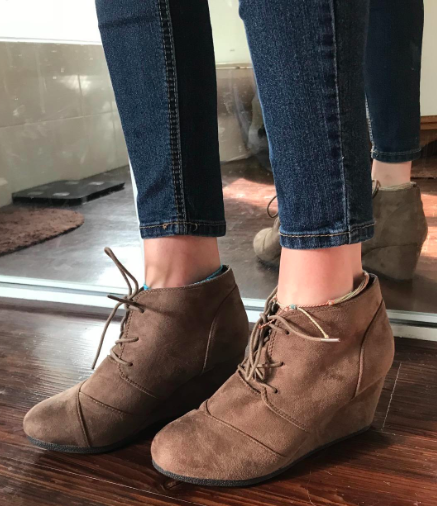 Sleek faux suede ankle boots, because these'll make it easy to dress up for work despite below-freezing temperatures. I'm sorry, but you can't call out sick again. 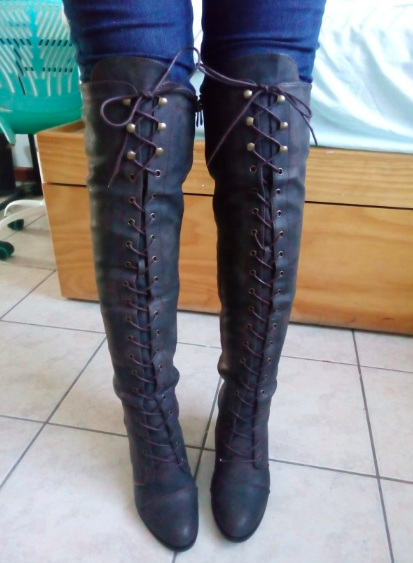 Promising review: "I have been eyeing this boots for weeks and I am so glad I finally committed to them! They are a lovely rich emerald green with fun details, like the angled heel and notch in the back. I'm able to wear tights and be comfortable. 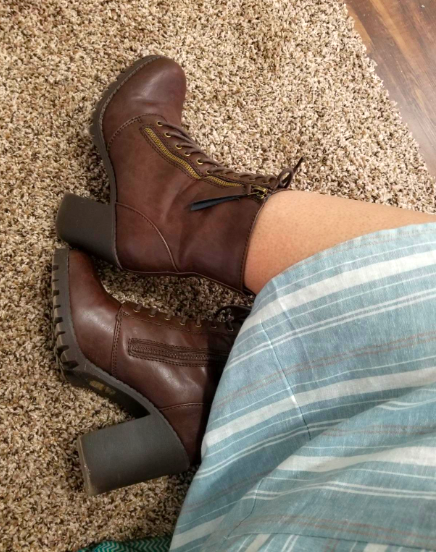 I work in a restaurant on my feet for ten-hour shifts and was nervous about wearing them, but they are actually super comfortable and I ended the day with no pain! 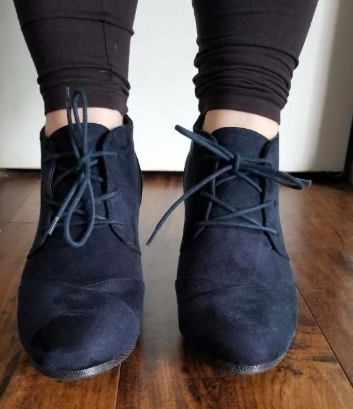 I've never left a review before, but these shoes inspired me to speak up because they are incredible! If you're on the fence, give them a try!" —L.L.A. Get them from ModCloth for $79 (available in sizes 5-10). 19. Wide-calf, faux leather wedge boots that'll make sure you don't get ~cold feet~ about leaving the house. You have a new outfit to show off, my friend. Get them from Amazon for $19.99+ (available in sizes 5.5-11 and five colors). 20. Leopard print platform Chelsea boots so you can take a walk on the wild side — even in a winter wonderland. Get them from Urban Outfitters for $64 (available in sizes 5-10). 21. Faux leather chunky combat boots for reaching new heights when it comes to combining comfort and style. Will these make 2019 your year? I think so. Get them from Amazon for $29.50+ (available in sizes 5.5-11 and five colors). 22. Leather lace-up flat boots, because looking extra polished shouldn't always require uncomfortable heels. These'll instantly make any ensemble feel sophisticated. Get them from Bangi Shop on Etsy for $128 (originally $160+; available in sizes 6.5-11.5 and four colors). 23. Faux suede knee-high boots that'll add some much-needed color to your sea of all-black clothing. I know the sky is constantly gray, but that shouldn't affect your wardrobe. Promising review: "These boots are a great value. They're comfortable and versatile. I have muscular calves and was worried that these would not zip all the way up. They did zip up due to the stretchy panels sewn into several areas of the boot. I have gotten several compliments on these already! I'm super glad I gave them a try!" —Genene Y. Get them from Amazon for $18.68+ (available in sizes 6-11 and eight colors). 24. Plaid lace-up block heels with suede trim so standing up to frightful weather feels easy when supported by these tough allies. You are NOT going to fall on the sidewalk today. Get them from Shopbop for $59.40 (originally $198; available in sizes 5-10). 25. Splurge-worthy Sorel snow boots for matching practicality and a fashion-forward twist. Dare I say we might actually want it to snow now? They're weather-resistant, waterproof, and insulated for extra warmth! Get them from Amazon for $121.45+ (available in sizes 5-11 and three colors). 26. Platform chunky-heeled booties, because unfortunately you can't stay in all winter and these'll make dressing up comfortable and simple. I wish we could hibernate, but we can't. Get them from Amazon for $5.99+ (available in sizes 5-10 and 11 colors). 27. Snakeskin cutout boots that'll look amazing with fashionable socks or tights and a snowy backdrop. Feel free to take the picture and immediately go back inside. Get them from Nordstrom for $39.98 (originally $99.95; available in sizes 5-9.5). 28. Faux leather buckled calf boots so you're not up to your knees in regret the moment you leave the house. You might even make it all the way to work without a sad sniffle. Get them from Amazon for $39.99 (available in sizes 5.5-9.5 and four colors). 29. Round-toe lace-up moto boots with metallic patchwork for looking red hot even when walking through the toughest of winter winds. Get them from Amazon for $31.90+ (available in sizes 5-10 and two colors). 30. Tie-back block-heeled boots, because I can't tell the future but I'm extremely confident these'll never go out of style. It's you two against the world now. They also have a wide-calf design with stretchy faux suede. Get them from Lane Bryant for $70.99 (originally $89.95; available in sizes 7W-12W). 31. Betsey Johnson embellished velvet boots that'll make your outfit sparkle despite all the lovely slush on the sidewalk. Get them from Amazon for $34.99+ (available in sizes 5-9.5). 32. 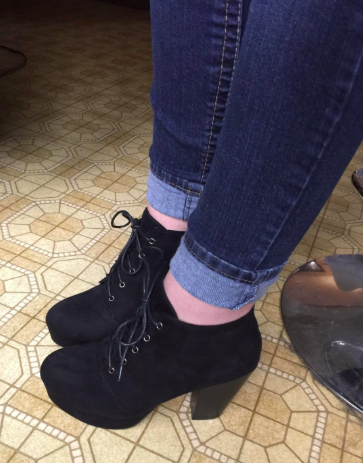 Faux suede sock booties so you can be sure your outfits never fall flat. We will not be stopped by a few flurries. Get them from H&M for $39.99 (available in sizes 4.5-10). 33. Tasseled ankle boots for turning your heel on choosing between comfortable commutes or cute shoes. You deserve to have BOTH. Did I mention they're made of chic faux suede? And they come with or without faux fur lining! Get them from Amazon for $27.99 (available in sizes 5.5-10 and four styles).